Boffins are putting together a new catalogue of all the confirmed planets that could harbour extraterrestrial life, with seven worlds in our Milky Way making the list so far. The Habitable Exoplanets Catalog, a project of the Planetary Habitability Lab at the University of Puerto Rico, looks at the planets spotted by the High Accuracy Radial Velocity Planet Searcher (HARPS) and the Kepler Space Telescope and narrows those worlds down to those with the most potential for life. There are nearly 80 confirmed exoplanets in the sky and 250 Kepler candidates, all similarly sized to Earth, but only a few of them could really support life because they're the right distance from their sun to have liquid water. The Catalog uses the Earth Similarity Index to classify and rank the habitability of these planets, whittling out those that are Earth-size or physically similar to Earth, but not actually Earth-like. The criteria in the index are the variability of energy from the host star, the mass of the planet and the size of the world. 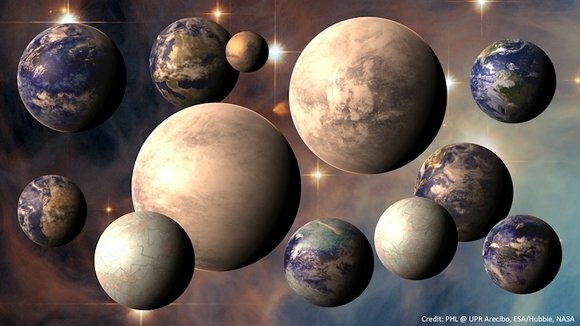 Boffins have decided that seven of the worlds could support alien life, with 27 more NASA Kepler candidates awaiting confirmation. Controversial Gliese 581g made the list, despite the fact that its existence has been disputed. 581g is claimed to orbit the red dwarf star Gliese 581 in the constellation of Libra, the sixth planet discovered in the system and fourth from the star. But HARPS wasn't able to fully confirm the discovery first announced by the Lick-Carnegie Exoplanet Survey late in 2010. Also in the Catalog are HD 85512b, Kepler 22b, Gliese 667Cc, Gliese 163c and HD 40307g, all of which are super-Earth planets. The project will be expanding its models and analysis in the next year, which may impact some of the worlds already listed, but could also add more planets.